Miners work illegally in the biggest tin mine in Bangka island is seen in Pemali, Indonesia on May 8, 2016. Tin is one of essential materials for manufacturing semiconductor and electronic components. 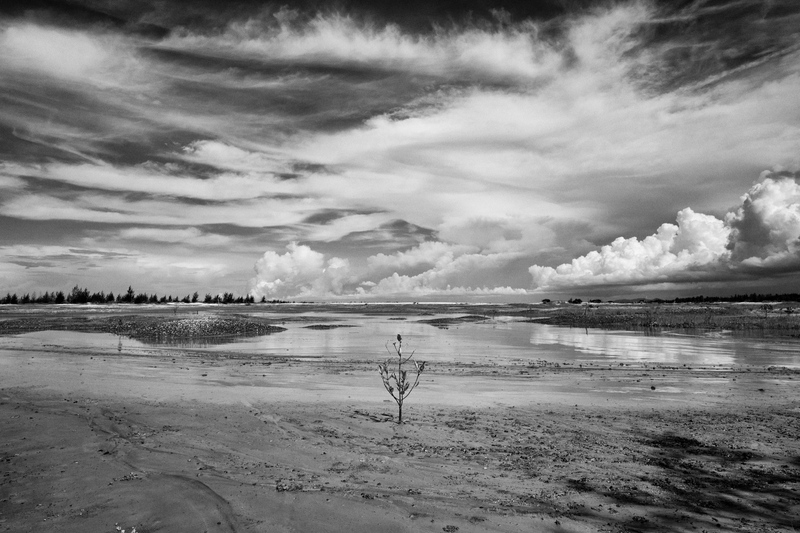 Bangka island has been one of the world's principal tin-producing centers and it amounts to 30% of global tin production. For more than 300 years, tin mining has been main industry of Bangka Island, and 60% of Bangka residents are engaged in tin industry. 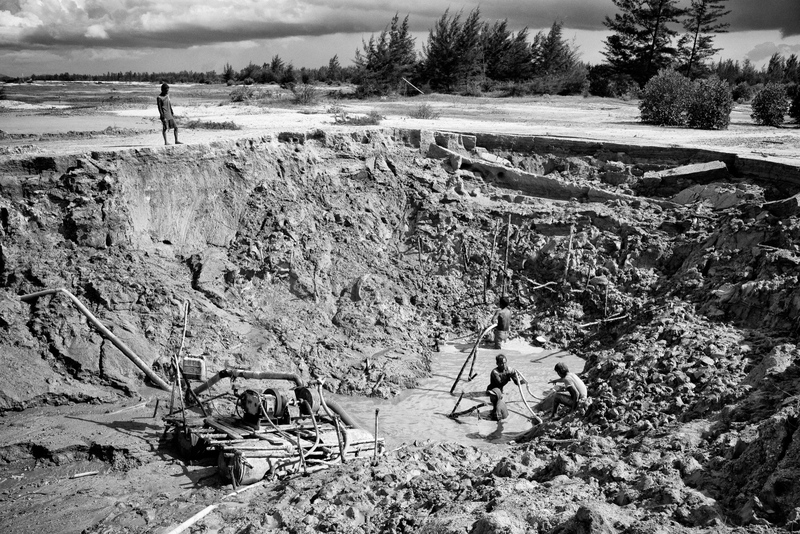 However, for past decades, worldwide soaring demands for tin brought out countless illegal mining, and the whole island is facing serious environmental destruction and human exploitation as consequences. Recently, Indonesian government initiated regulation on tin production and distribution to protect tin industry and environment. 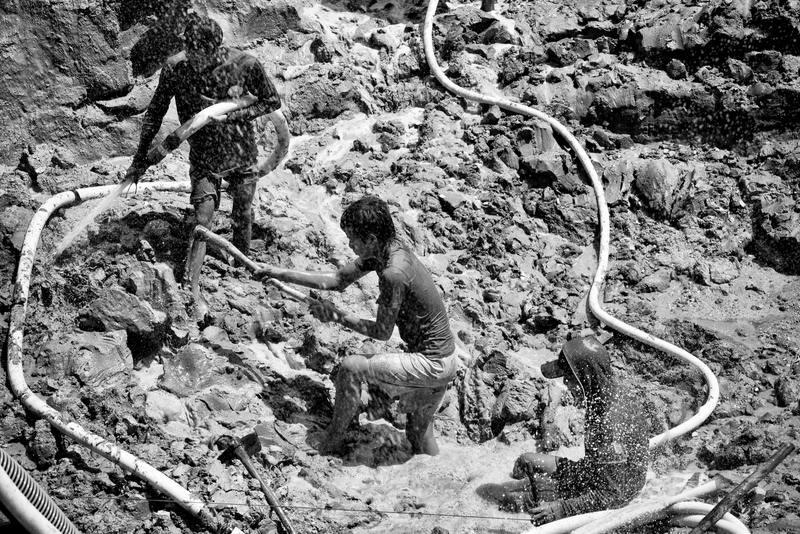 Illegal tin miners work at a pit at Airanyir in Bangka Island, Indonesia on May 5, 2016. 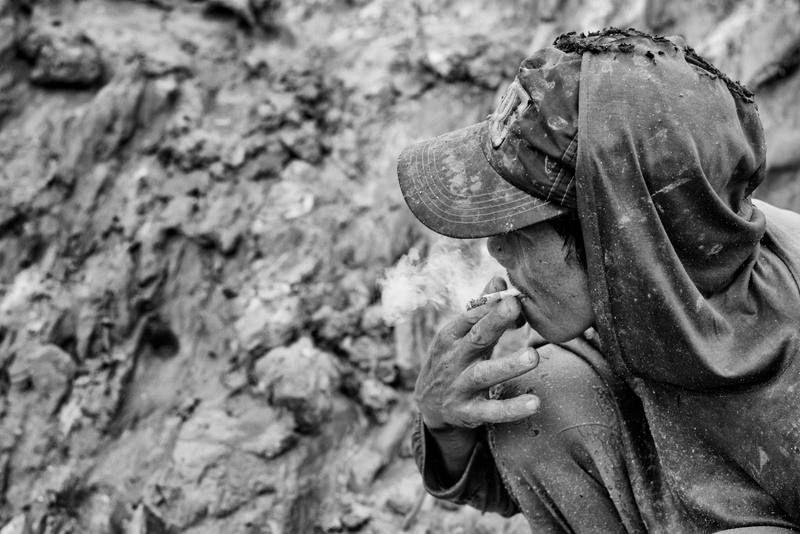 An illegal tin miner smokes a cigarette while working at a pit at Airanyir in Bangka Island, Indonesia on May 5, 2016. Illegal tin miners cut down trees to make a pit at illegal tin mine in forest near Rambat village at Bangka Barat in Bangka Island, Indonesia on May 7, 2016. 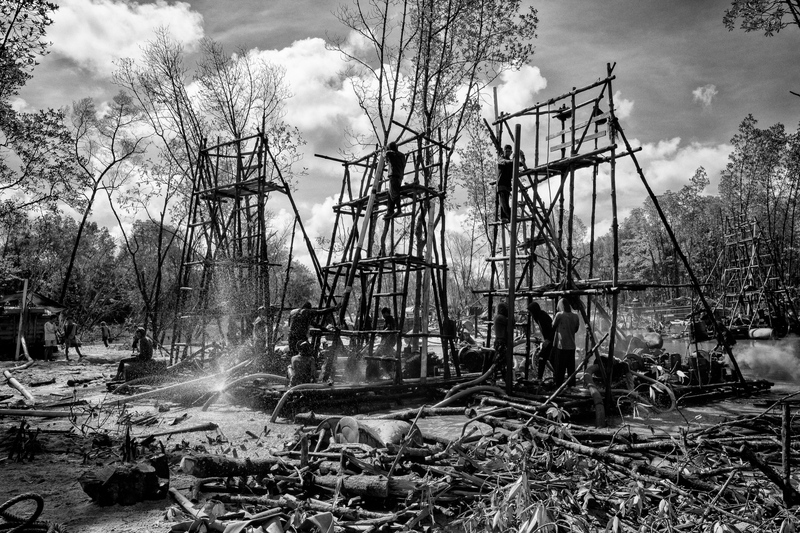 Illegal miners work at wooden rafts to dredge for tin ore in a mining pit in forest near Rambat village in Bangka Island, Indonesia. Most of these illegal miners are from outside of Bangka Island, and they brought many problems like drug, prostitute, robbery and etc. to local community. Environmental destruction is a huge problem as well. 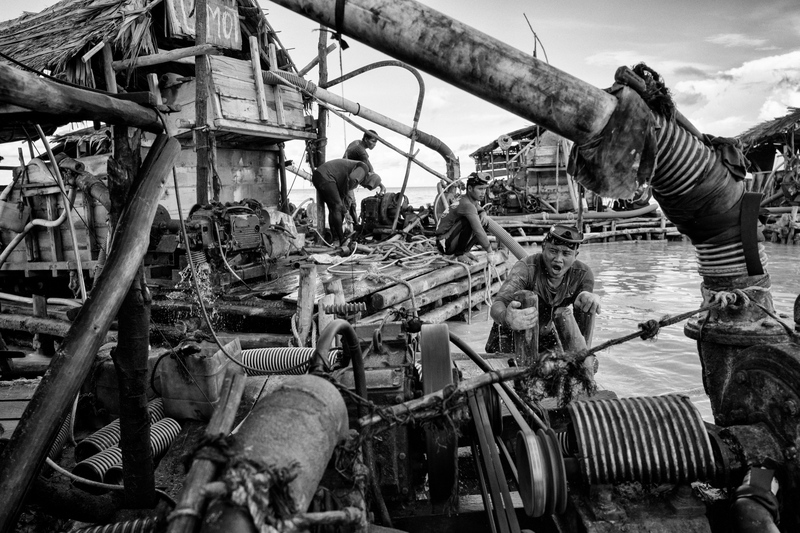 Illegal tin miners work at an offshore tin mine at Rebo Beach in Bangka Island, Indonesia on may 6, 2016. 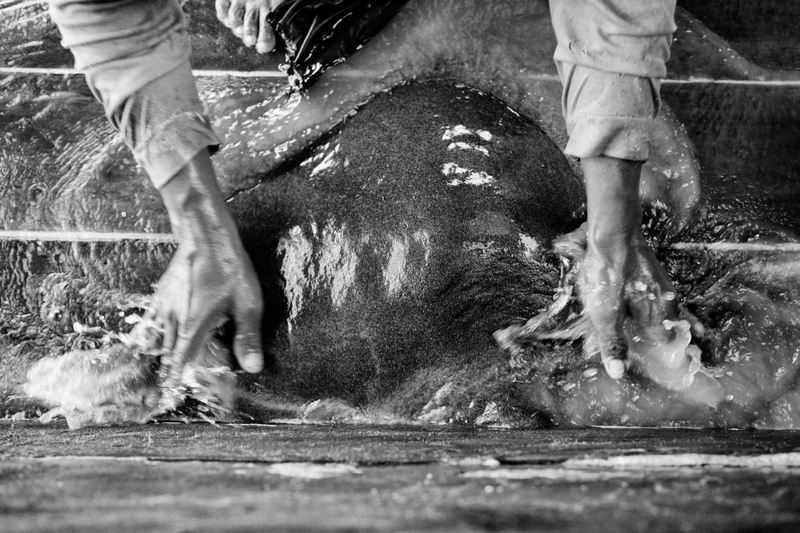 Illegal miners dig into seabed 5 to 7 meters deep without proper protection gears. They get oxygen through thin rubber tube connected to a motor on a pontoon. Sometimes a worker gets buried and killed by underwater landslide even without noticing it. Illegal offshore tin mine has destroyed sea environment particularly coral reefs. Illegal tin miners gather tins from mixed ocean sand on a pontoon near Rebo Beach, Bangka Island, Indonesia on May 6, 2016. 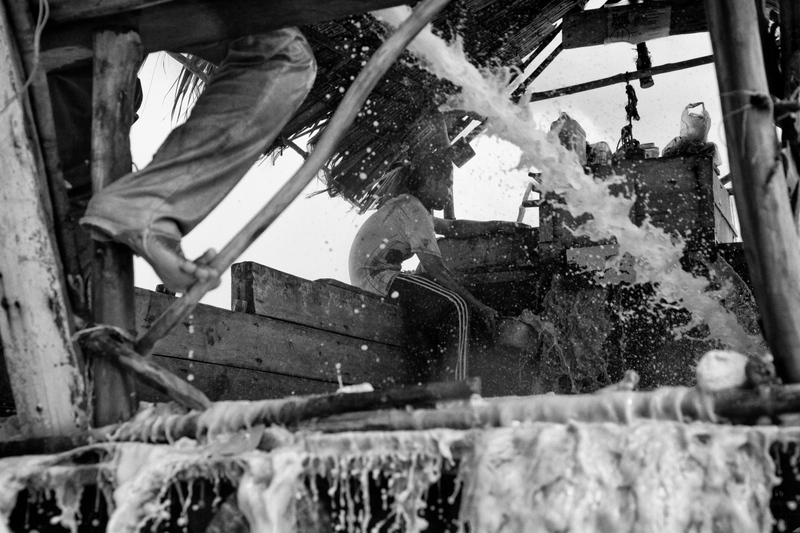 An illegal tin miner gathers tins from mixed ocean sand on a pontoon near Rebo Beach, Bangka Island, Indonesia on May 6, 2016. 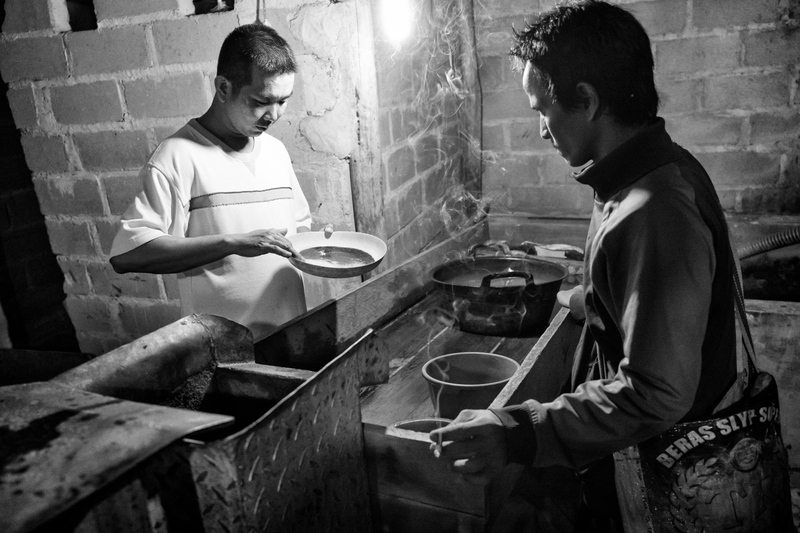 Lew Cosan, the dealer who is 37 years old and has been in tin distribution black market for 15 years, examines the quality of tin which a local man tries to sell at his house in Deniang village in Bangka Island, Indonesia on May 9, 2016. 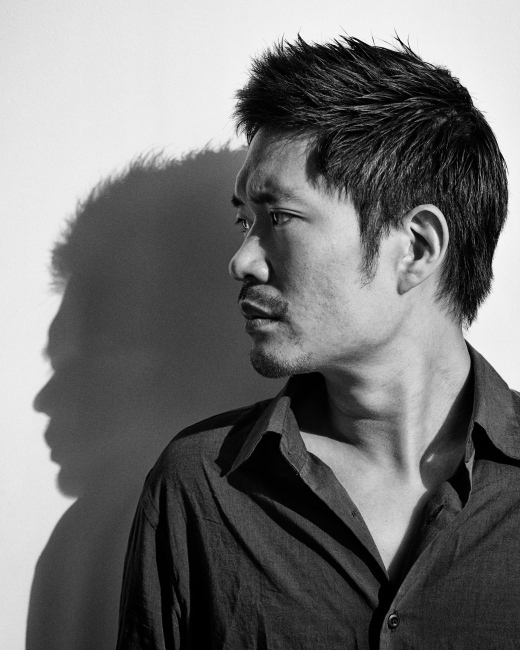 Lew claims that his business supports local people who are in need of financial support. He buys more than 100kg of tin from local people a day, refine it and resell it to smelters. 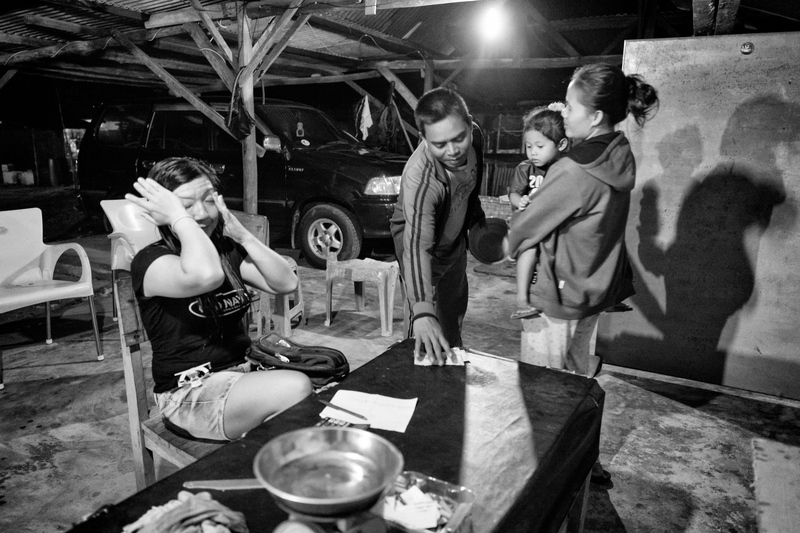 Local family gets money for selling tin to an illegal dealer at her house in Deniang village in Bangka Island, Indonesia on May 9, 2016. Roaidi and his son Kuruniawan take rest on his fishing boat at West Bangka sea, Indonesia onMay 7, 2016. 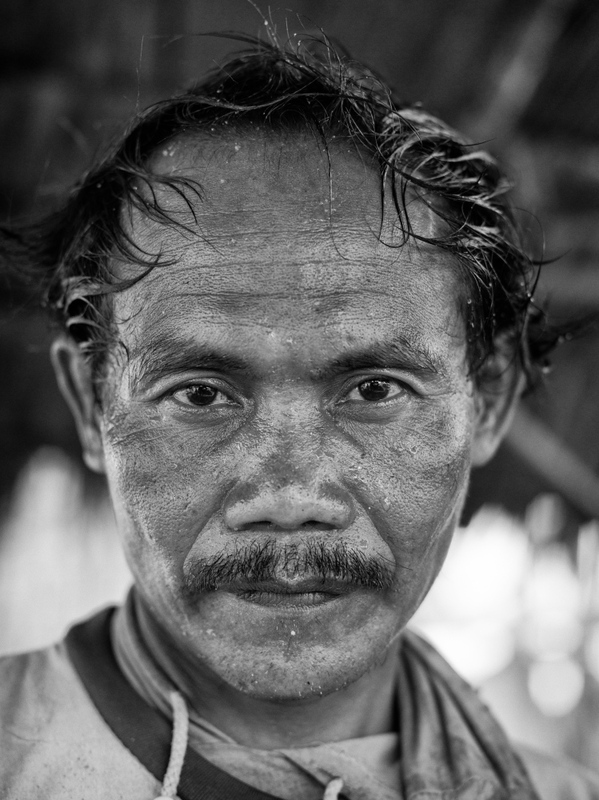 Roaidi, a 50 years old fisherman who is a native to the area claims that the ocean is seriously damaged by offshore tin mining. He used to get 25~35kg of fishes per day in 1 miles from the shore, but he has to sail to 25 miles from the shore to get that amount. 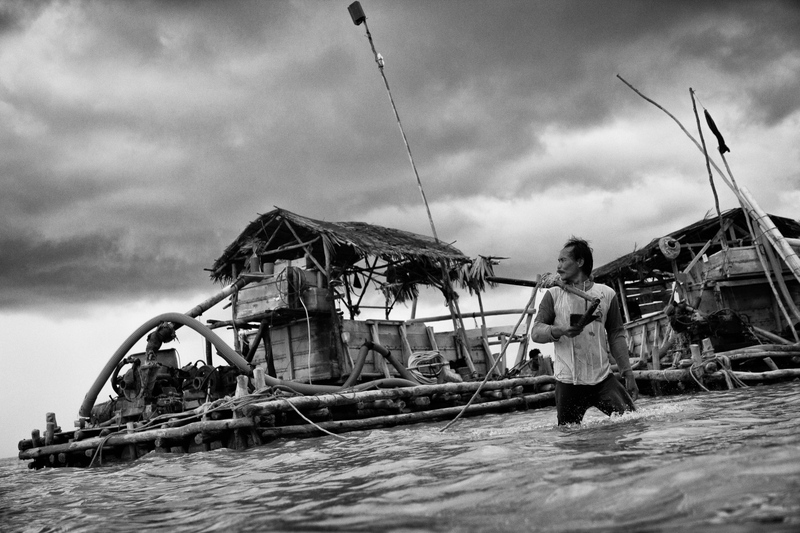 Paino, a 38 year old illegal tin miner from Lampung in Sumatra takes pose for a portrait on a pontoon near Rebo Beach, Bangka Island, Indonesia on May 6, 2016. Paino, has worked in tin mining industry as a minier for 15 years. A small tree is seen at a tin mine in Airanyir in Bangka Island, Indonesia on May 5, 2016. 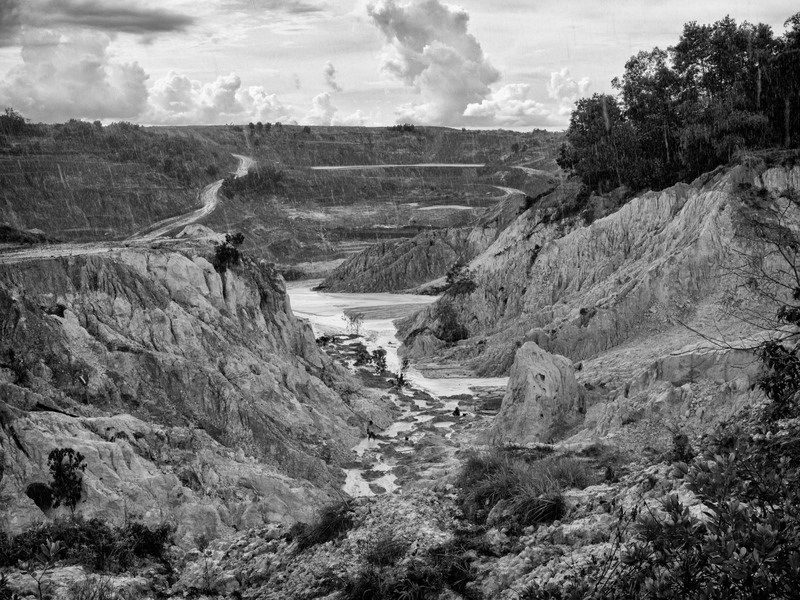 The whole area used to be filled with thousands of trees but it has been destroyed by tin mining for over decades.